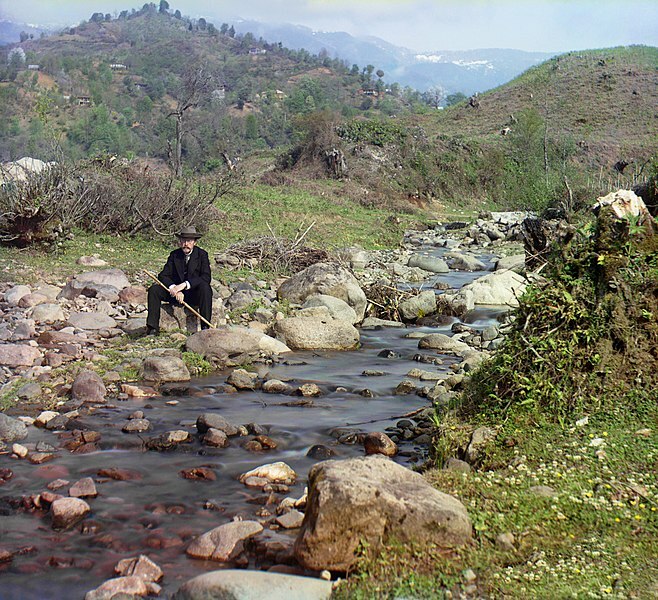 Sergej Prokudin-Gorskij | Pioneer of colour photography « efix:photography – News. Thoughts. Pictures. Back in Prokudin-Gorskij’s days, black-and-white photography was the standard, 35mm still photography wasn’t invented yet and there were no colour emulsions anywhere near as sophisticated as those of the late 20th century. Thus, to take photographs in full colour, Prokudin-Gorskij used a technique invented in the mid-19th century by Scottish physicist James Clerk Maxwell — the three-colour process. This process works essentially the same way as modern 3CCD video cameras, which record each of the three basic colours red, green and blue on an individual sensor. But where a modern video camera uses a beam splitting prisma to project the three colours onto the three sensors each, Prokudin-Gorskij’s camera worked a bit differently — it exposed three consecutive frames in quick succession, using a different colour filter (one red, one green and one blue) each time. The photographs were monochrome each, but when projected through coloured filters and overlapped, they would yield one picture in the full visible colour spectrum. Since photographic material in that time wasn’t very light sensitive, each exposure would last for a couple seconds, so his subjects had to remain extremely still during the whole capturing process. Some of his photographs thus show more or less strong “ghosting” where one or two of the individual frames do not overlap properly. Nonetheless, Prokudin-Gorskij’s 10,000-ish pictures are unique in the photographic world not only because they are early examples of full-colour photograph, but also because the scale of Prokudin-Gorskij’s documentation of the Russian Empire of the early 1900s was not only unique in his own time, but is enormous even by today’s standards.